Americans on the home front wanted to know what they could do at home to do their part in winning the war. The mantra, “Waste Nothing” was always the short answer. Waste nothing meant efficiency of every possible resource and thing, including time and human energy. Efficient home making was the goal in homes across America during WWII. 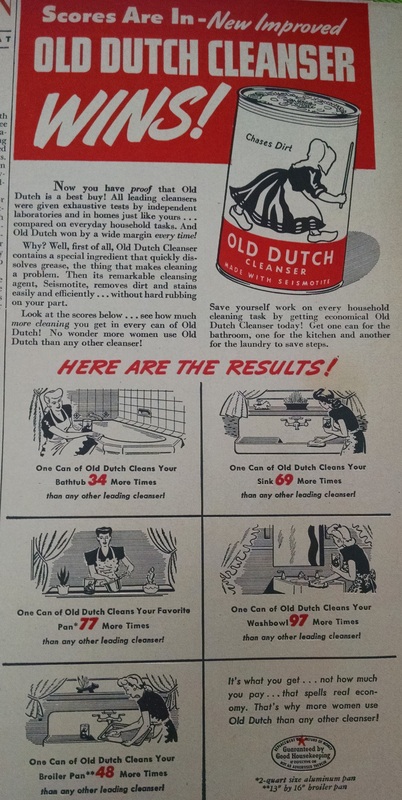 In a Woman’s Day magazine ad during winter of 1943, extensive testing is described that proves the Old Dutch Cleanser with Seisomtite is more economical and efficient than any other brand. 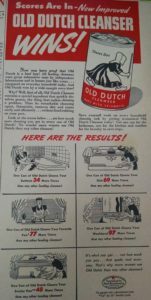 Advertisement for Old Dutch Cleanser published in 1943. It ‘cleans your bathtub 34 more times than any other leading cleanser’, ‘your sink 69 more times’, ‘your favorite pan (which they describe as a 2-quart aluminum pan) 77 more times’, ‘your washbowl 97 more times’, and ‘your broiler pan 48 more times’. The ad goes on to say ‘you should get one can for the bathroom, one for the kitchen and another for the laundry to save steps.’ This is not a bad idea! I have located a cleaning supply kit on each floor on my home — the upstairs, main level, and basement level. Having all that I need without pulling it out and lugging things up or down stairs is actually a huge time-saver and nearly half the battle when it comes to just starting the project of cleaning an area. WWII had everyone thinking about highest possible efficiency. By the time the war ended and between 1946 and 1949, the University of Illinois School of Architecture Small Homes Council-Building Research studies introduced the world to their “work triangle” design study. The work triangle continues to serve as a standard of good kitchen design. The sink, stove, and refrigerator serve as the cornerstones of the triangle that make it possible to reduce wasted steps in time-motion studies originated for industrial applications in the late 1800’s studied by Frederick Winslow Taylor. No leg of the triangle should be less than 4 feet or more than 9 feet. The sum of all three sides of the triangle should be between 13 feet and 26 feet. Cabinets or other obstacles should not intersect any leg of the triangle by more than 12 inches. If possible, there should be no major traffic flow through the triangle. A full-height obstacle, such as a tall cabinet, should not come between any two points of the triangle. As measured between counter tops and cabinets or appliances, work aisles should be no less than 42 inches for one cook, or 48 inches for multiple cooks. A sink should have a clear counter area of at least 24 inches on one side, and at least 18 inches on the other side. 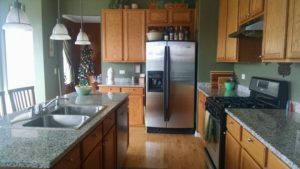 A refrigerator should have a clear counter area of at least 15 inches on the handle side; or the same on either side of a side-by-side refrigerator; or the same area on a counter no more than 48 inches across from the refrigerator. A stove or cook top should have a clear 15 inches area on one side, and at least 12 inches on the other side. At least 36 inches of food preparation area should be located next to the sink. In a seating area where no traffic passes behind the diner, allow 32 inches from the wall to the edge of the table or counter; if traffic passes behind the diner, allow 44 inches. So, how efficiently designed is my kitchen? No leg of the triangle should be less than 4 feet or more than 9 feet: I have two triangle legs that measure 44”, falling short by 4” to be efficiently designed. The sum of all three sides of the triangle should be between 13 feet and 26 feet: My sum of legs is 158”, a mere two inches above the appropriate distance. Cabinets or other obstacles should not intersect any leg of the triangle by more than 12 inches: No problems here. If possible, there should be no major traffic flow through the triangle: No problems here. A full-height obstacle, such as a tall cabinet, should not come between any two points of the triangle: No problems here. As measured between counter tops and cabinets or appliances, work aisles should be no less than 42 inches for one cook, or 48 inches for multiple cooks: My aisles are 44”. 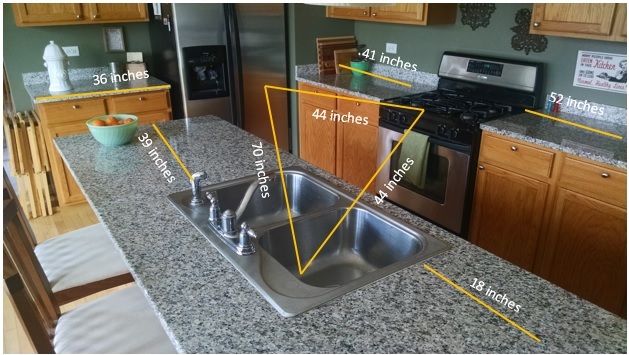 A sink should have a clear counter area of at least 24 inches on one side, and at least 18 inches on the other side: My sink has 18” exactly and 40” of counter space. A refrigerator should have a clear counter area of at least 15 inches on the handle side; or the same on either side of a side-by-side refrigerator; or the same area on a counter no more than 48 inches across from the refrigerator: My counter on the handle side is 41”. My other counter, outside of the triangle is 36”. Being outside of the triangle, it hardly ever gets used! Now I know why. A stove or cook top should have a clear 15 inches area on one side, and at least 12 inches on the other side: My counter tops on each side of the stove are 44” and 52”. At least 36 inches of food preparation area should be located next to the sink: I have 39” of food prep area on the right side of the sink. Space inside the triangle is used often. The area outside of the triangle is not used very much at all and clutter accumulates there. In a seating area where no traffic passes behind the diner, allow 32 inches from the wall to the edge of the table or counter; if traffic passes behind the diner, allow 44 inches: Two counter top chairs are well within the 44” rule. When we moved into our home, there was an area set aside for a table between the counter and patio door area. It had a low-hanging lamp above the table area and was in the path of the pantry closet and patio door. No wonder it had to go! It felt extremely jarring to sit there. It’s math!! The math explains it all!